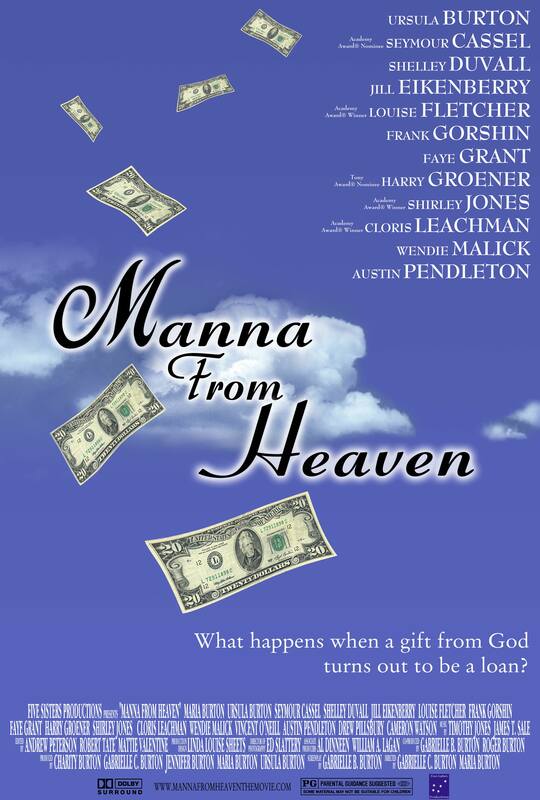 MANNA FROM HEAVEN is a lighthearted comedic fable about what happens when you get a “gift from God” (a financial windfall), but many years later you find out it was a just a loan — and it’s due immediately. A feel-good film with a star-studded ensemble cast, MANNA is a delightful and refreshing comedy. The problem is, nobody has the money, nobody wants to give back the money, they don’t know to whom it belongs, and most of them can’t stand each other. Theresa has some tall talking to do to get this querulous group on board, but her gift was always to see the best in everyone, and she eventually wins them over. Each one of them starts doing it for selfish reasons (Bunny and Ed are con artists who think they’ll take the money and run; Inez, a hard-nosed casino card dealer is going to have no part in it until she starts falling for a secret service agent…) — but in the process, get caught up in their community and something larger than themselves. What follows is an witty, intelligent, feel-good comedy about rediscovering hope at any age. Through the ensemble comedy’s fun twists and turns, the characters (played by an all-star cast) learn about family, romance, reconciliation and redemption by overcoming the personal obstacles that have been holding them back in life — and the city’s community also blossoms in the process. By working together they begin to realize their full potential and each, in a moment of selflessness, finds the dreams they thought the money would buy them. “An excellently crafted film and a thoroughly enjoyable experience!” (IMDb): This film is a gem and a true piece of art. On all points of skillful, tasteful filmmaking, “Manna from Heaven” ranks high. The screenplay is superbly written, and it is difficult to imagine a better cast than that utilized by the Burton team. The cinematography and editing demonstrate a firm command of the film medium. If you like your movie-going pleasure laden with charming wit, beautiful scenery, and the right balance of sentimentality, this is the film for you. “A lovely way to spend an evening” (IMDb): I had a wonderful time at the show, and my friends and I spent the rest of the evening talking about Manna. Splendid performances, great writing and cinematography: that’s what I call a moving picture. “An uplifting comedy with twists and turns!” (IMDb): Extremely well written, cast and directed…Dialogue is witty, engaging and funny with characters that are a bit out there. It’s great to see a feature film that has a backbone to it and a theme of doing the right thing. “Two Thumbs Up!” (IMDb): All in all, this film is fabulous – RUN, don’t walk, to go see it!